Working many years in eCommerce area and dealing with the Magento platform, I often read about Magento popularity, numerous positive aspects, and huge prospects of this platform. In the meantime, for the last years I have often faced with complaints from different Magento extensions developers about declining in sales of their extensions. 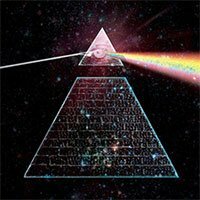 Other developers say that there is no growth in sales. So, based on my observations I can say that almost all Magento extensions developers are dissatisfied with their sales dynamics. In order to overcome arisen contradiction, I decided to answer the question: Is Magento still popular and long-range attractive platform? In other words, whether the Magento market share is so significant as numerous researches state? Whether the Magento Market share grows constantly and grows faster than its competitors? Is Magento platform really the best choice for existed and new merchants? And finally, what should Magento extensions developers do to increase sales of their extensions? Here is the first article of the series where I have tried to evaluate the real eCommerce market share and perspectives of Magento. People who have been looking at the eCommerce market for a long time, remember numerous researches and reviews that show the eCommerce platforms popularity on the market. One of the most famous researches is a series of Magento market studies conducted by aheadWorks company from 2013 until recently. Here are the links to the most noticeable articles about the Magento Market share published in 2015 and 2017. Taking a look at these articles you will make sure that they were based on Magento websites percentage calculation among all eCommerce websites included in the Alexa Top 1M. Let me explain in simple words. We have Alexa 1M websites. In this article we will mention Alexa 1M as top one million websites by Alexa with the highest traffic on the Internet. It doesn’t mean that all of this million websites are eCommerce stores. Among this Alexa 1M there are X eCommerce stores. We don’t know how many eCommerce stores exactly existed. 100K, 500K or other quantity wasn’t specified in considering researches. 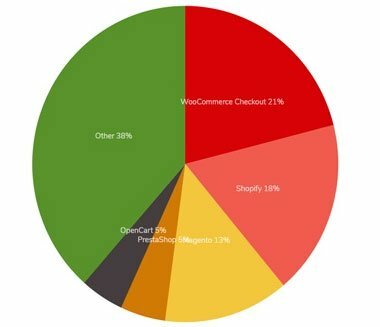 But the researches have a diagram or a table with information that shows, for example, the number of stores on Magento CE was 24,8% of total X eCommerce stores at that time, while Woocommerce platforms had 26% popularity. They assumed that considering the eCommerce stores from Alexa 1M for 100% they could determine individual shares of each considered ecommerce platform. So, for example, Magento CE has 24,8% the eCommerce market share. Let’s take a look at one more eCommerce market research published by Cloudways at the end of 2018, were an author tried to identify Market shares of the top eCommerce platforms. This pie diagram was built on the base of BuiltWith 1M websites. The author states that WooCommerce with nearly 24,000+ websites out of one million has 21% of eCommerce market share. Magento with 15,000+ websites has 13% the eCommerce Market share. Looks familiar? Here is the link for the up-to-date data. Pay attention to the title of this diagram. It tells us only about the eCommerce platforms popularity among all ecommerce websites in Builtwith Top 1M. BuiltWith Top 1M is a mixture of of the 100k Quantcast, Alexa and some Builtwith Top sites from different sources. It doesn’t mean that all of this million websites are eCommerce stores. Among Builtwith Top 1M websites there are X eCommerce websites. 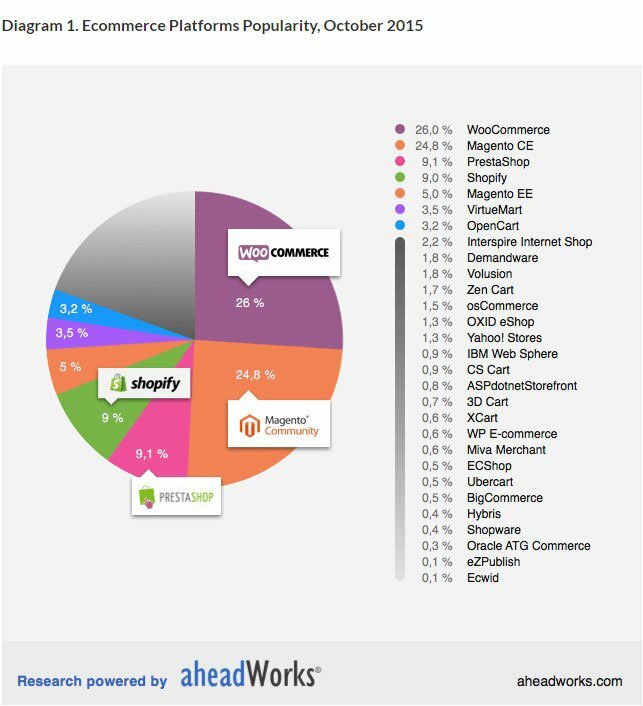 19% of X the ecommerce websites refers to Shopify, 13% of X the eCommerce Websites refers to Magento. Do you see now what a mistake the previous researches made? Let me ask you a question. What does the X mean? The X – total number of eCommerce websites among BuiltWith Top 1 million. But X doesn’t represent all eCommerce websites on the Internet. Moreover, Builtwith Top 1M and Alexa Top 1M, as well as Quantcast Top 1M, contain only smaller part of all eCommerce websites. So, the studies based on the research of any Top 1M, 100K, or 10K websites couldn’t be used to calculate market share of any eCommerce platform. Let’s take into account one more aspect of Top 1M, 10k, 10K websites. 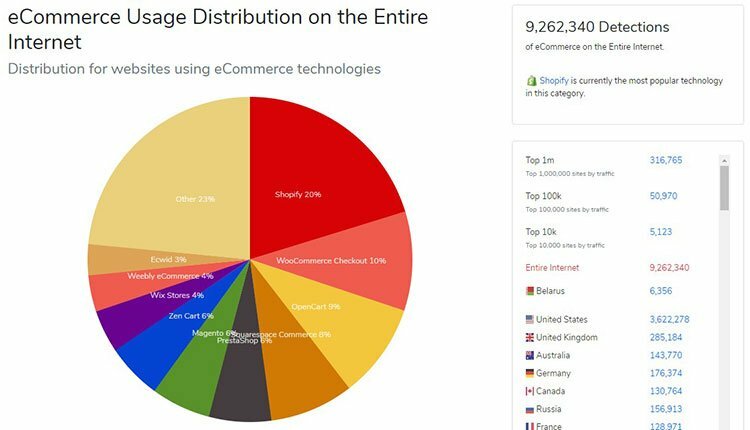 What Does eCommerce Usage Distribution in the Top 1 Million, 100k or 10K mean? 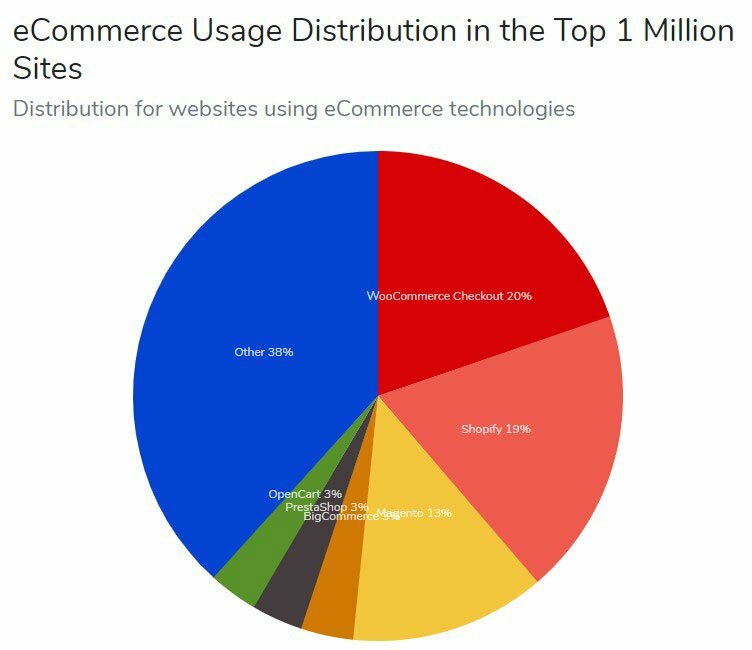 eCommerce Usage Distribution in the Top 1 Million Sites diagram describes a minority of the most successful web stores. Apparently, an eCommerce store is not able to become a successful one instantly. It takes several years to get noticeable traffic and sales. So, eCommerce platforms percentage in the Top 1M, 100K, 10K reflects previous platforms popularity rather than their actual popularity and perspectives. But this statement should be complemented. One of the Reddit users noticed that many web stores are not created from scratch these days. If any store in Top 1M is re-platformed it will still be in top 1M. In general, the higher website traffic is the longer it takes to get such traffic. It can be seen easily if we look at the difference between platforms popularity in the Top 1M, 100K, 10K. Now let’s refer to another famous source of statistical information: SymilarTech website. In the Top 10K there are such old platforms as IBM Websphere Commerce and Magento. In the Top 100K Magento is on the first place, while in the Top 1M we can see Magento on the 4th position and Woocommerce as a leading platform. The researches based on platform popularity in any limited Top websites selection such as Alexa Top 1M, Quantcast Top 1M, Builtwith Top 1M, Inc. 500 or similar ones don’t tell us anything about actual platform popularity and perspectives. They “highly likely” refer to platforms popularity and growth dynamics in previous years. Market share is the percentage of a market (defined in terms of either units or revenue) accounted for by a specific entity. In our research we are considering the eCommerce platform market, not the entire eCommerce market. So, we aren’t interested in revenue generated by all web stores based on certain platforms. It couldn’t tell us anything about a platform popularity and perspectives. The most interesting for us is a percentage of a certain platform on the ecommerce market defined in terms of units. In other words, the percentage of a web stores quantity based on the certain platform to all the eCommerce stores on the Internet. To evaluate any platform popularity and perspectives we should consider not only the most successful websites but all eCommerce websites on a chosen platform. As we know, the most of web stores have medium and low sales and traffic. These are web stores of small and medium companies as well as new stores that have appeared recently and now are growing. There is a problem. It is not easy to find a valid number of web stores quantity on a certain platform such as Magento and a quantity of all eCommerce stores on the Internet. Different data sources provide different numbers. We will rely on the data from two main sources: Datanyze and Builtwith. First, let’s consider all Magento stores. How many Magento stores are there worldwide? Datanyze Universe shows us that Magento has 5.91% market share with 234,622 stores. This data is close to BuiltWith one with 232,599 currently live website. On the base of two main sources we can conclude that there are about 233K Magento stores worldwide. 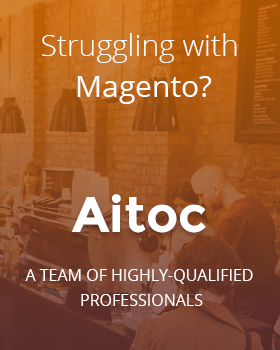 It is very close to 250K merchant mentioned in a Magento report. Almost the same number we can find here. How many eCommerce stores are there worldwide? If we sum all of the websites on all 477 platforms provided by Datanyze we get 3,941,615 web stores in the word. 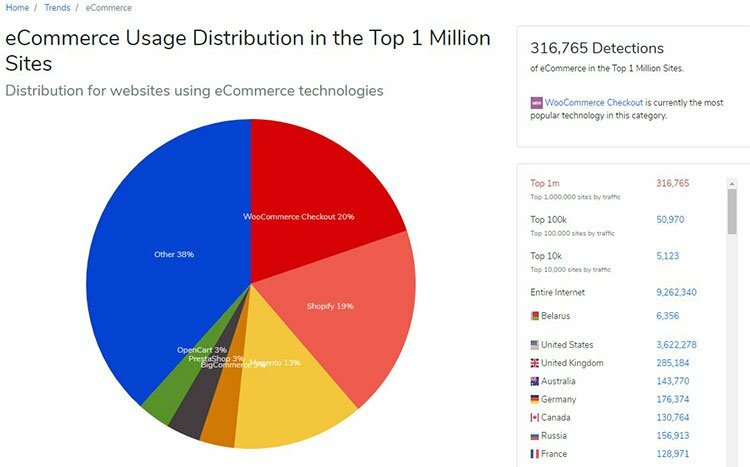 According to Datanyze there are about 4M ecommerce websites in the world on 477 platforms . Let’s compare these numbers with BuiltWith data. According to BuiltWith we have 232,599 currently live website. How many eCommerce website are in the world? Let’s take a look at Builtwith diagram again. It shows that there are 15K Magento websites among Alexa 1M. Anyway, I need total eCommerce websites number on the Internet, not only in the Builtwith Top 1M. Let’s follow down by the numbers. Top 1M, Top 100k, Top 10K ….. Bingo! Entire Internet! On this diagram we can see 6% of Magento Market share which is very close to 5,9% by Datanyze. Thanks to Gary Brewer I knew that 9,262,340 Detections didn’t mean that there were 9,262,340 eCommerce stores in the world. Because I wasn’t able to sum all platforms quantity, I made a simple calculation. We know that there are 232599 websites on Magento which is 6% of total Ecommerce websites in the world. So, the Number of Total eCommerce websites is 3876650 websites (232599 / 6% ). This number is very close to Datanyze’s 3,941,615 websites. Thus, Magento market share in April 2019 is about 6% with 233K websites on Magento among total 3,9M web stores on the Internet. It looks easy but the calculation process of the total web stores number on the Internet is not so straightforward. The number highly depends on the approach that a researcher uses to identify different platforms. As we can see, only Magento platform has similar numbers. Other platforms have significant differences. Moreover, Datanyze numbers change every day. That is why we can see differences in Datanyse tables. I think that matching of the total web stores on the Internet by Builtwth and by Datanyse is a coincidence. So, we should pay attention to identification and calculation process of all numbers: a certain platform-based stores number, the total web stores number on the Internet, and a platform market share. These numbers strongly depend on the platform identification and counting approach. In this article I have analyzed several wrong approaches to any eCommerce platform market share evaluation. In my opinion, we can find correct market share calculations in Builtwith eCommerce Usage Distribution on the Entire Internet and Datanyze Universe ecommerce platform market share. We shouldn’t rely on any eCommerce platform Market share number without research of identification approach because the numbers highly depend on the methodology used for the platforms identification and calculation. In the next article I will analyze the growth dynamics of the Magento platform. 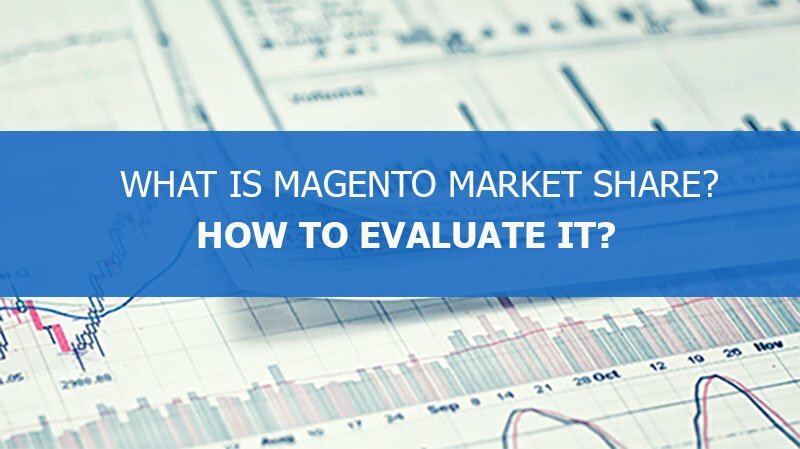 I will try to give the right answer for the question: whether Magento is still popular and long-range attractive platform or most of sources make wrong conclusions based on outdated and distorted information. Alex is a digital marketing researcher, analyst, and growth hacker who works in eCommerce and Magento ecosphere for more than 7 years.